I too am sorry to hear of your loss. I had to put down my cat which I had for 18 years. Ol' Bear was with me through thick and thin and I was heartbroken for years. Losing a pet is losing a member of your family. I hope you are feeling better soon. 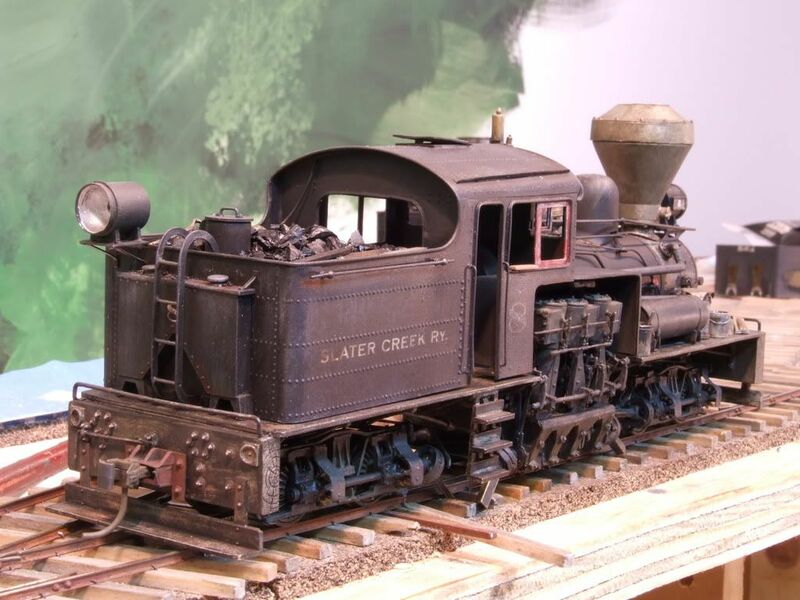 The work you do on this site continues to be a great source of inspiration for me and especially for those of us from West Virginia or anyone interested in Appalachian railroading. Take care. Sorry to hear about your loss. I am in a modeling funk of my own too. I look forward to the next update as always. Jeff, I know that it is a hard thing to do. I had to put down my working Border Collie a few years ago, who was really my buddy. Now we have 4 dogs and 4 cats, and I am not looking forward to any of them getting too old or sick. My thoughs are with you. thank you everyone, it really seems weird to be working in the layout room without him sitting in there with me, he was only 11 years old, was dianosed with lung cancer and there was nothing we could do for him. When I was young we had lots of pets but this was my families first and he did become a family member and the only pet I ever bonded with myself. what was so strange was that he was pretty normal and other than he developed a cough about 6 month ago, we brought him into the vet and they said we could do some test on him, but he seemed in great health and was eating and doing everything great. Six months later he got really bad one day, I brought him in and they basically said to bring him home and keep him as comfortable as possible for his last days, I was shocked. His entire life was was in great health and we never had to bring him to the vet for anything. 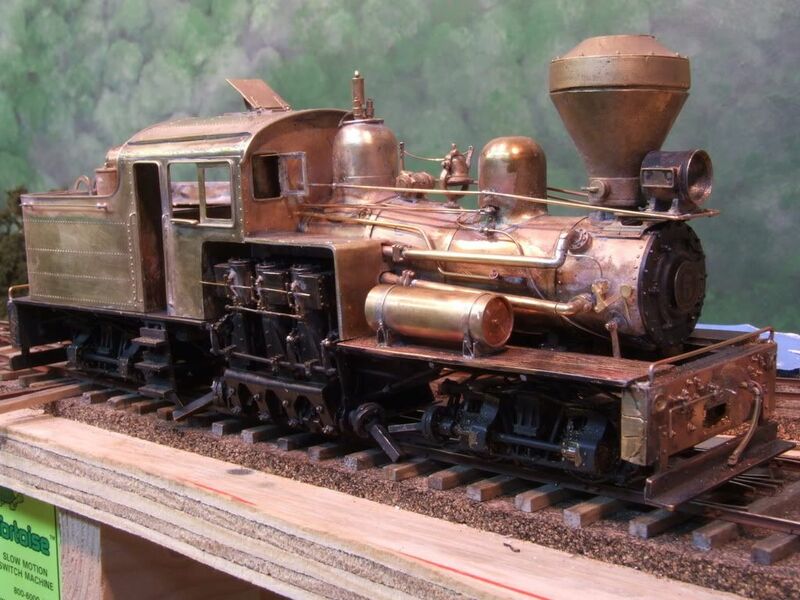 I did some work on the Shay last week, still waiting for my parts from Grant Line, and I am having some parts for my hoppers custom laser cut, which will speed up the pocess of building the last 23 of them. I can build a hopper pretty quickly until I get to the hardware (like door latches and levers) so I had someone custom cut me a sheet of those parts. Once I get the shay running I will get back to the layout. I will finish the backdrop the best I can and get on with building the coal dump trestle. Here is an update. I have put everything on hold until I get my shay done. I need the shay done to make sure it will operate on the layout from here on out. I still have not received my order from Grandt Line with the new gears, but I called and they said i could see it today, I can't wait, it has been over three months since I placed the order. the metal work on the shay is mostly done. I have to make the coupler pockets yet but I may make those from styrene and make them part of the coupler boxes. There is not much of the original Kemtron shay left, above the frame the only parts are the boiler and the domes. 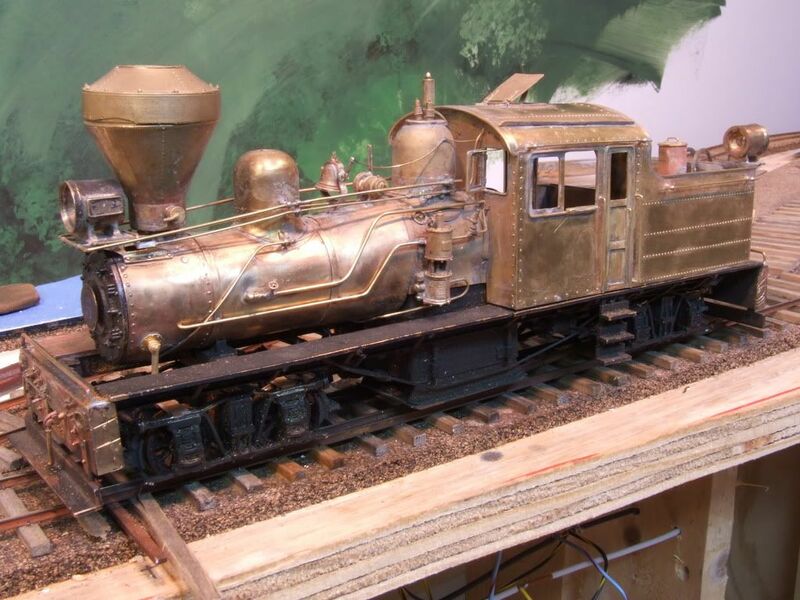 I was going to build a new boiler with a taper right behind the smoke box but I figured that for what I paid for this I better keep something of the original locomotive. I made all the windows open and the engineer side door open. I have not attached the engineer side door yet, I want to clean the inside back cab wall first and having the door attached would make that hard to do. here are some photos I took before sand blasting, while there is still some shinny brass. Next I will sand blast it and get it painted. it has been a long process but I like that my shay looks different from most I have seen and it really fits its operating area well. I can't wait to get back to layout building. 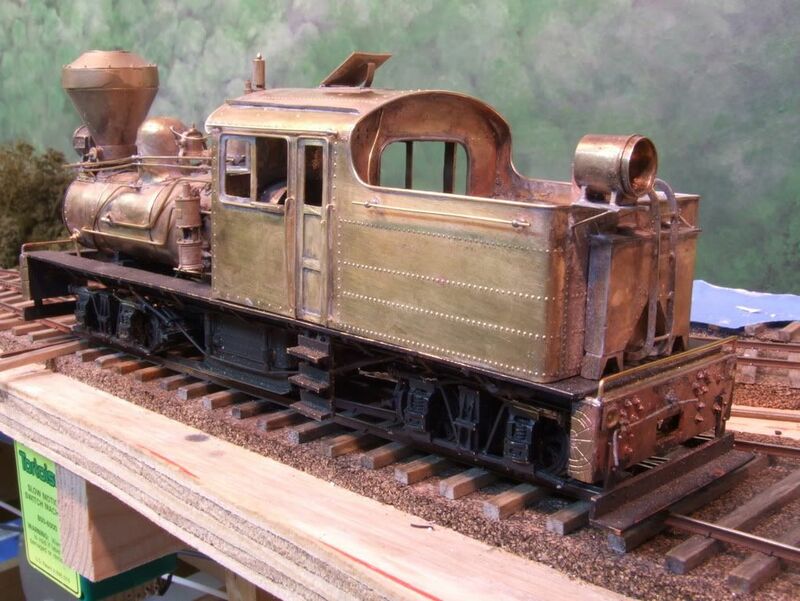 The next shay I do will be all scratch built and be a little smaller, but still a three cylinder version. Very happy to see you back at it again. That Shay is very distinctive and is going to be an award-winner. The attention to detail is astounding. Very nice work on this machine, Jeff. I'm always impressed when I see such a fine craftsmanship on metal parts. Very, very nice work. I would be scared to death to attempt a modern style cab/tender. Your rivet work is superb, what are you using a NWSL riveter? Brian, I am using a NWSL riveter, the brass is 0.015 brass. working with the 0.15 brass is nice because it rivets good and makes a nice structural model. 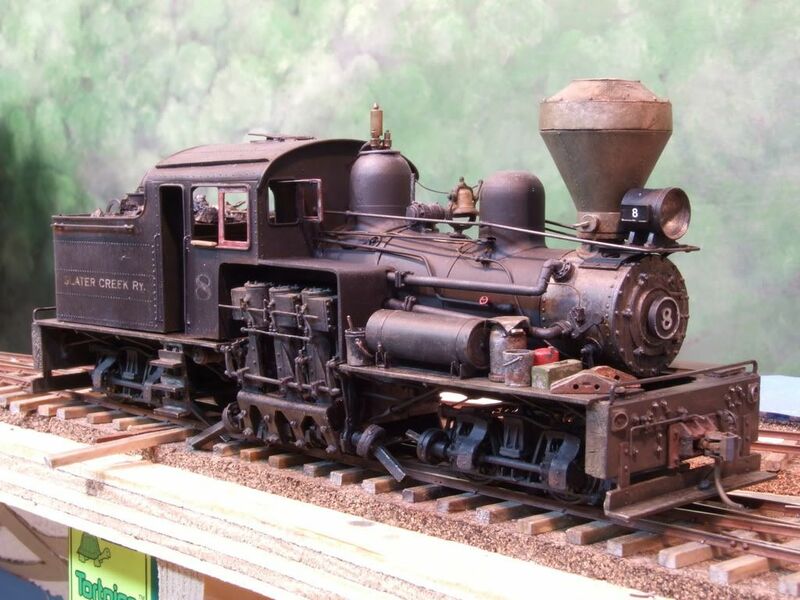 The first tender I tried on my reguaged Bachmann On30 shay I built a substructure and made a riveted overlay. This time there was not substructure. I made the sides seperate from the end of the tender because the riveter will not do one long piece, which actuall worked out better because I could leave the end a little long to get the curve and then trim up the end square before soldering the riveted tender end in place. The roof was the hardest thing to do by far, almost gave up after struggling with it. I had to rivet the roof panel first before I curved it and I also had to leave it a little long so I could work the curves in. It took a lot of fussing to get it all even. In the end I did trim a little too much from once side of the cab roof but I filled the gap with some brass and covered it with solder. I also got all done and realized I trimmed off the front overhang, so I had to make a new overhang piece and solder it on. I talked to Grandt Line and they said I should get my gear this week. I really can't wait to get this engine running. I have a Faulhauber motor for this engine as well. There is a large speaker in the firebox and a 3/4" diameter speaker in the smoke stack, so it should sound like the locomotive sounds are coming from the engine itself and not the tender like most steam locomotives do. I installed the flickering light bulbs in the fire box under the speaker and it looks pretty neat to see the look of fire under the engine. I really look forward to seeing it in paint. Can you tell me more about the Faulhauber motor? I imagine that makes for super slow running? the Faulhaber motors are small gear head motors that are very very quite. They are no longer made but Keith Wiseman has a few for sale on Ebay. They make a 16:1 and a 59:1 motor. I believe the 16:1 were used by Grandt Line and PSc for some of their smaller railtrucks, the 59:1 had more power and were used in locotives. The 59:1 motors that Keith sells has a 3mm shaft but they used to have a 2mm shaft. I have been keeping my eye on Ebay for a while and I got a 59:1 with a 2mm and now I can use some of the Grandt Line gears to regear my shay. I am sure that regearing a locomotive could be done with the 3mm shaft, it will just take a little digging to get the correct gear or coupling. The motors run fantastic, makes a can motor seem like an old 3 pole open frame motor. there is no cogging at all and these motors are so efficient that they coast forever and do not need flywheels. the motors are not cheap though, they run around $80. I may pick up one of those 16:1 motors because I want to make a rail truck or speeder someday and I think these motors will work great for something like that. Last weekend I visited Mark Chase's On30 Piedmont & East Blue Ridge layout and it really put me back in the mood to get modeling again. I have not stopped but I slowed a little and the visit to Mark's house was just what I needed to kick me back into high gear. I am really busy at work doing 50-60 hour weeks and we are still in the middle of "kid�s sports" season but I managed to get some more done. I am still working almost exclusively on the shay project these days but I did find some time to try modifying one of the MC hopper cars I was building. This hopper is about 80% finished and has been a test bed for me since a lot of the fragile details have not been installed which makes it easier to work on. I have not been happy with the look of the San Juan Evolution couplers on the MC hopper cars, the MC used link and pin couplers but for operation I wanted to use knuckle couplers. 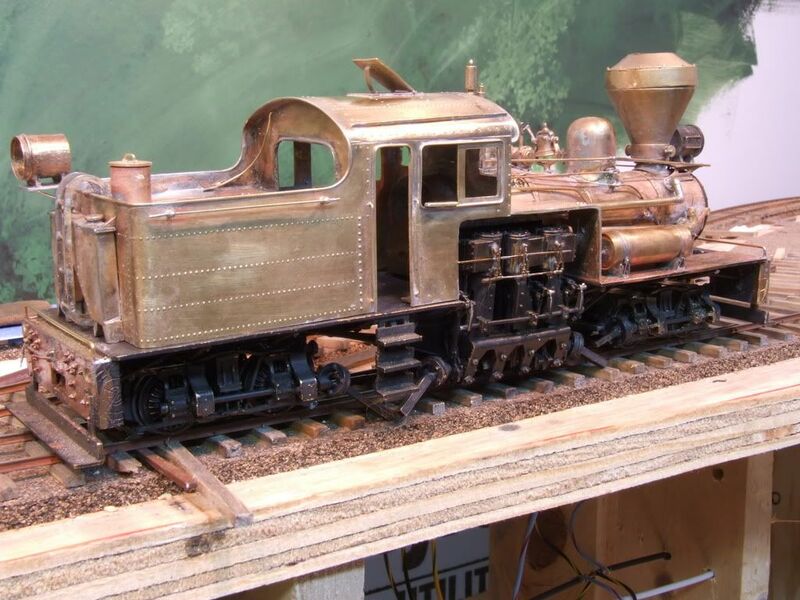 When I first built the hopper cars I did not have a layout and I did not know how far out to mount the couplers so the ends of the brake wheel platform would not hit each other on sharp curves, I first planned to have really sharp curves when I was building these in On30. when I switched to On3 Brian Bond convinced me that a 30" minimum radius would be better, which gave me plenty of clearance between hoppers and my coupler spacing now made the cars look too far apart, good thing I only have seven at the moment. 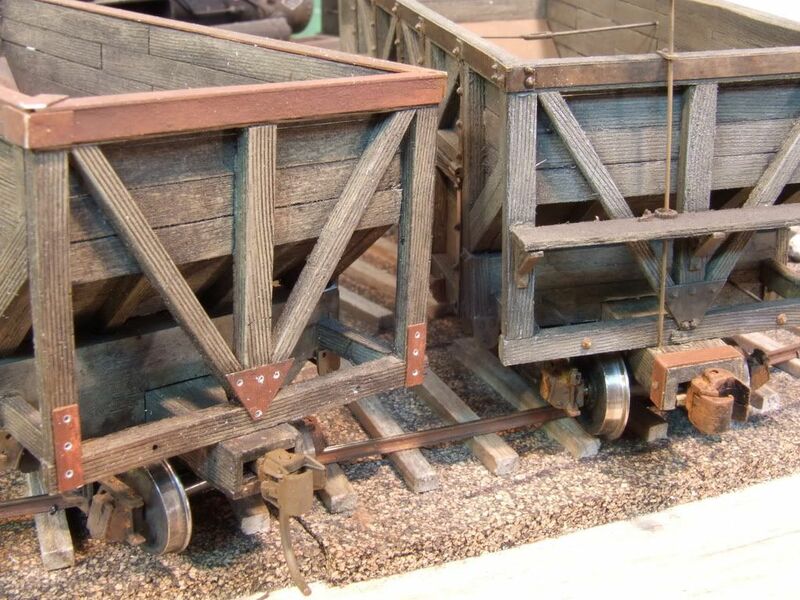 I also did not like how the SJC couplers operated, I did some modifications to the hoppers which helped them operate better but they still did not operate as flawlessly as Kadee couplers do. So I decided that I would install Kadee #803 couplers in my hoppers and I would move them back into the car to reduce the space between cars. I still have not decided it I should remove the trip pins yet so for now I am leaving them, if I decide down the road that I never use them then I will cut them off. Here is a photo that shows the differences, the car on the left is the Kadee and the car on the right is the San Juan Car Company Evolution coupler. Last weekend I did not travel from Minnesota to Virginia just to visit Mark Chase, I was there attending a Lacrosse tournament with my daughter. While I was at the tournament I noticed a black substance on the artificial turf fields. I asked my daughter what was on the field and she said it was black rubber. When she got home the day after me she handed me a sandwich bag full of this black rubber, which looked a lot like coal. I had been looking for a coal substitute to that I could use which would eliminate the dust created by dumping real coal. When I first saw this ground rubber I thought that it would not flow as good as real coal but a quick test showed that it worked just fine. 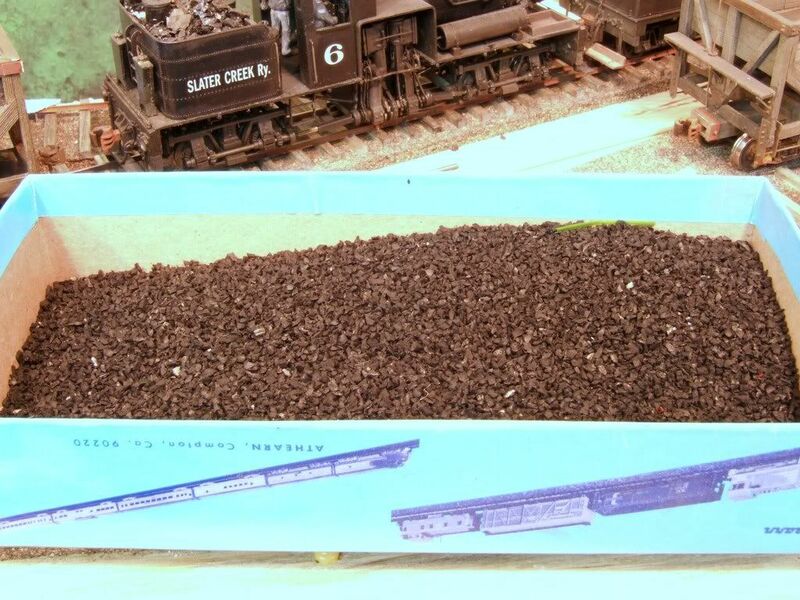 The rubber is also lighter than real coal which will help the hopper cars not be so top heavy when loaded. Unlike traditional hopper cars which carry the load down between the trucks the MC hoppers carry all of the load above the trucks which makes them very top heavy. Here are some photos of the rubber. I am still waiting for my order from Grandt Line, it is going on five months since I ordered it. I have made a few calls to them and I keep getting the response that it is getting close to shipping. Without that order I can�t get the drive for my shay assembled. While waiting for the Grandt Line parts I started the painting process. I cleaned the brass parts in baking soda and water, after which I sand blasted it to give the brass some tooth to hold the paint. I airbrushed the model with a mix of Polly Scale engine black and brown. The smoke box was brush painted Tamiya gun metal and for something different I painted the stack with Testors metalizer non-buffing steel. The window frames on the outside were painted caboose red and dry brushed with some grayish tan to simulate wood showing through the worn paint. After I install the real glass I will put a wood frame on the backside painted cab interior green. I weathered the model with washes of acrylic paint. I painted the trucks and the cylinders off the model so I could get in and all around them with paint with a brush. I also weathered the trucks and the cylinders off the model using acrylics and Bragdon powders. I used my �powder in paint� technique to build up oily dust and grime on the cylinders and trucks and up under the frame and walkways, some areas are built up thick to simulate years of build up. The tops of the walkways and the pilots and foot boards were painted a mix I used to paint my MC hoppers, it is a color that looks close to raw basswood, which I then weather with black and brown washes of acrylic paint. I dry brushed some black on the pilot surfaces to make it look like wood is showing through worn black paint. I had to paint all the NBW castings on the pilot to make them look like steel and then I weathered each bolt head with rust and black washes. A little Bragdon powder helped blend in the colors on the pilot. I painted and weathered some detail parts to lay on the walkways, none of which I glued in place yet. On the walkways the MC stored various containers full of oil, grease, and what looks like sand. There are also rerail frogs, boards, tools, push pole, chains, and hoses, all of which I plan to add to my model. I have almost as many hours in painting this shay as I did building it. I installed the LED in the backup light and will glue a �plate� over the back of the light casting to hide the wires running down into the tender. 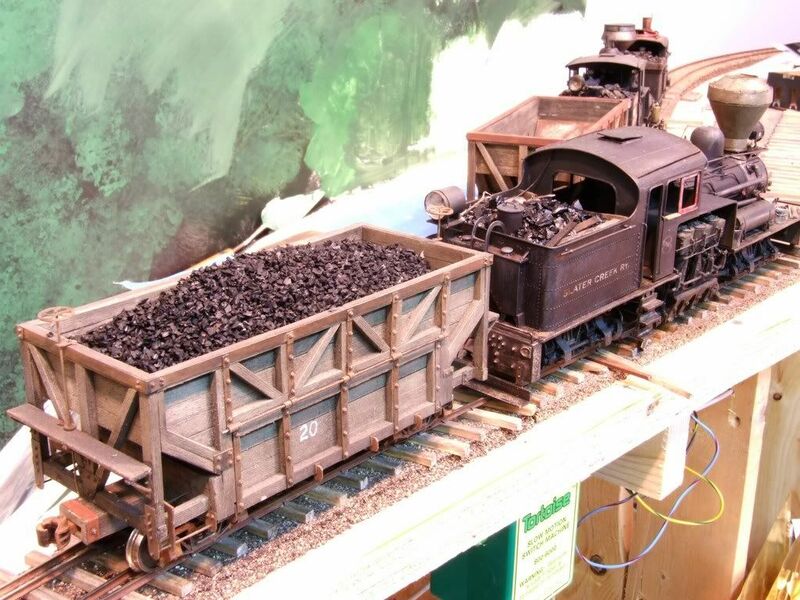 On the tender I glued real coal and added some boards and shovels on top of the coal load. I am not sure what the boards are for, I have seen them on the tenders of EBT locomotives and thought they would add some nice detail to my shay. Maybe they used the boards to help start the fires in the firebox, but they seem too long for that. Here are some update photos, I hope it won�t be too much longer to finish this locomotive, I really want to get back to layout building. Beautiful paint job on the shay. I am always amazed at how your work stands up to such close scrutiny. I must say I will miss the San Juan couplers ... I think they have the Kadees beat in the looks dept. That fake coal is quite a find. I have never seen anything like it. It must be fun to operate this railroad.